It’s been time for some thumb-twiddling over the last three weeks since the clutch was completed and the birds settled down to the serious business of incubating their four eggs. For those of you who have been following the webcam, the frustrations of it crashing as it became regularly overloaded with viewing traffic will be only too familiar. Fortunately these have been overcome, thanks to the efforts of staff in the University’s Estates Department and Computing Services. 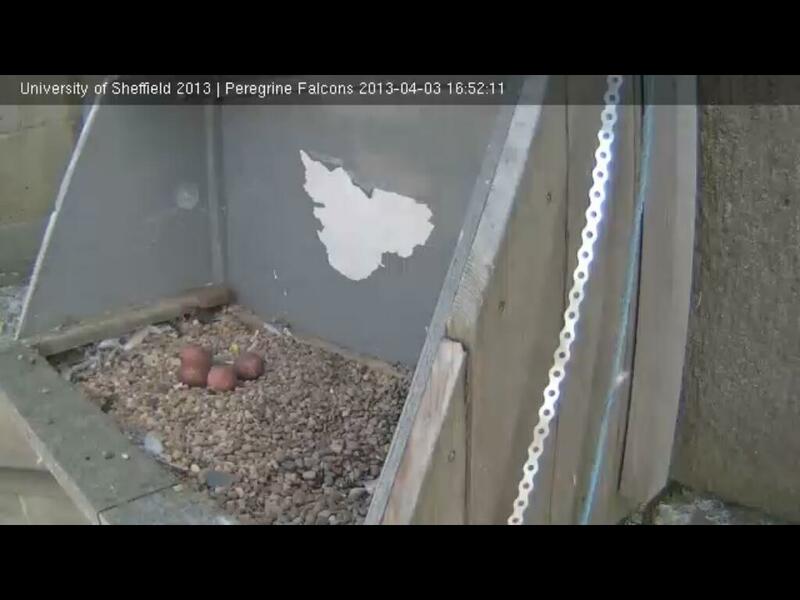 To recap, four eggs were laid between 27th March and 3rd April. Only when the third and fourth eggs had been laid did incubation get under way consistently, and since then the female has undertaken the great majority of the incubating, although the male has also done some stints. The birds can be sexed fairly easily by size (the female’s greater bulk and size overall cannot always be readily appreciated when there’s no point of comparison), but usefully the male is ringed and the female has pale buff fringes to the tips of her tail feathers. One of the things that the webcam has made it possible to appreciate since they’ve been incubating is what goes on round the clock, and it’s been interesting to see how active the female is during the night, shifting position and looking around. 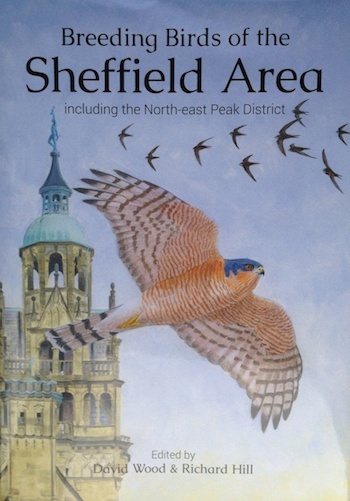 We’ve not seen it in Sheffield yet, but perhaps we’ll see this nocturnal activity take the form of night-time hunting, as has been noted with the Derby cathedral birds, which are ten days or so behind us this year in terms of laying date. The Notts pair are a week or so ahead of us and all three eggs laid have just hatched, despite concerns as the female incubated almost entirely covered by snow in late March: some impressive photos on their blog! During the incubation period, which averages 30-32 days, we have become accustomed to great views of the birds filling our screens, but not much else has been going on, and the male is often away from St George’s. The birds have a larder near to the nest and occasionally give some exciting flight views, but it’s a case of the calm before the action really gets under way. The eggs are expected to hatch around 3rd-5th May, after which the adults will start to bring food into the nest on an increasingly regular basis. Once this becomes established, we’ll be setting up Peregrine watches for anyone who wants to enjoy terrific views of the birds ‘in the flesh’, as in the picture above, taken a couple of weeks ago. Details of dates and times of the watches will be posted on the website, from where there are also links to the webcam and this blog. As predicted, the fourth egg was laid yesterday. There is a chance a fifth will be laid, but the clutch has now reached the average size for this species. The serious business of incubation will get under way now, with all being well the young hatching in late April/early May. 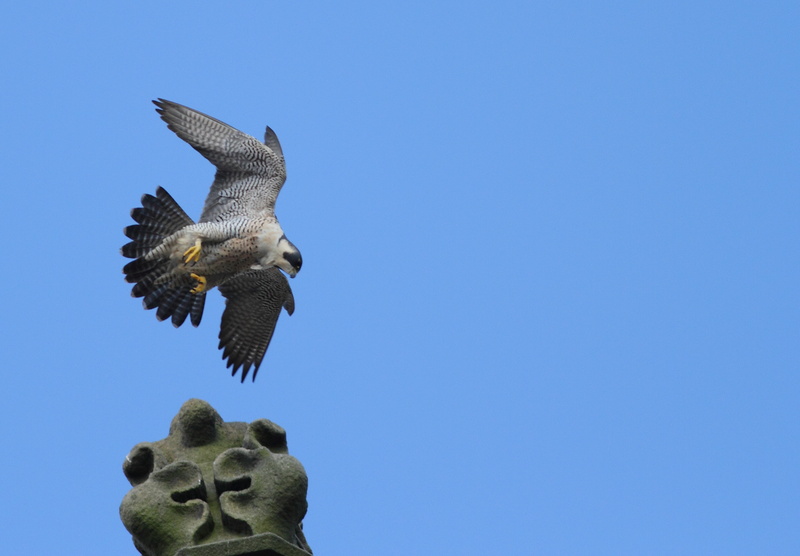 The latest update is the Peregrines had a busy Easter weekend, with three eggs now in the nest, the latest on Easter Monday (1st April). With the average clutch size four eggs, it is likely another will be laid very shortly. The birds are very active around St George’s, and it’s well worth a visit to the area to see these birds “in the flesh”. Many of you will have noticed the University’s webcam has had some issues – this is due to the birds being even more popular than anticipated and the feed getting too many visitors! 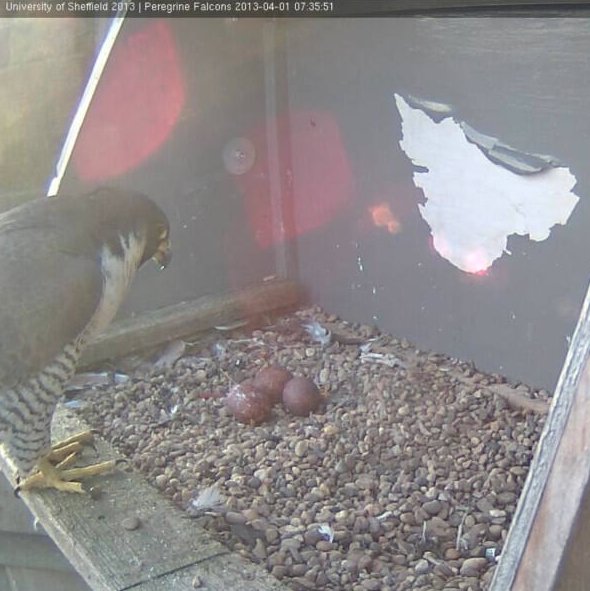 While this is being sorted the University have set up an alternative, non-HD alternative that can be found on the main Peregrine webcam page, meaning there’ll be a constant stream when people can’t get on to the main feed. 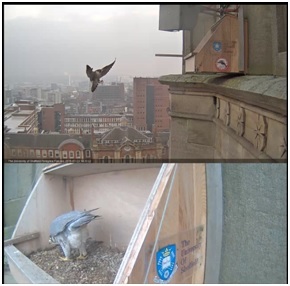 We’ve had a few questions about technical aspects of viewing the webcam – please note the SBSG are not involved with the technical side of things, and queries are best directed at the University’s peregrine Twitter feed @peregrines2013 (although we’ll try and answer them if we can!). 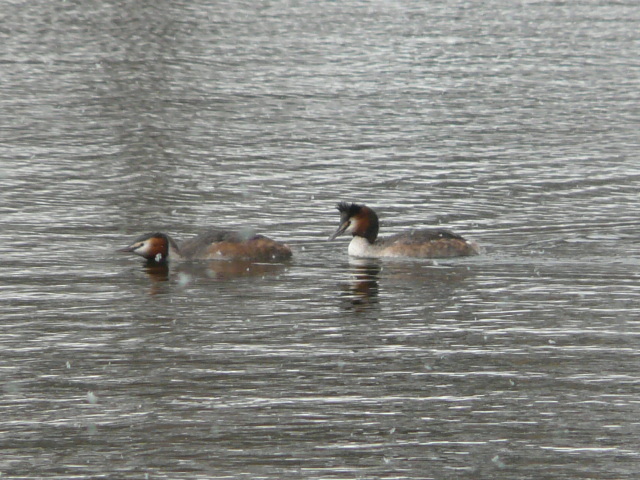 Finally, if you do visit the area to see the Peregrines, it’s worth taking a detour to Crookes Valley Park, where a pair of Great Crested Grebes have taken residence for around a fortnight. This is the first record of this gorgeous bird in the park, and lucky observers have been reporting the birds engaging in their remarkable courtship dance.